Better Futures Minnesota engages men who have had a history of incarceration, homelessness, poverty, and untreated mental and physical health challenges to help them achieve self-sufficiency and a better future for themselves and their communities. 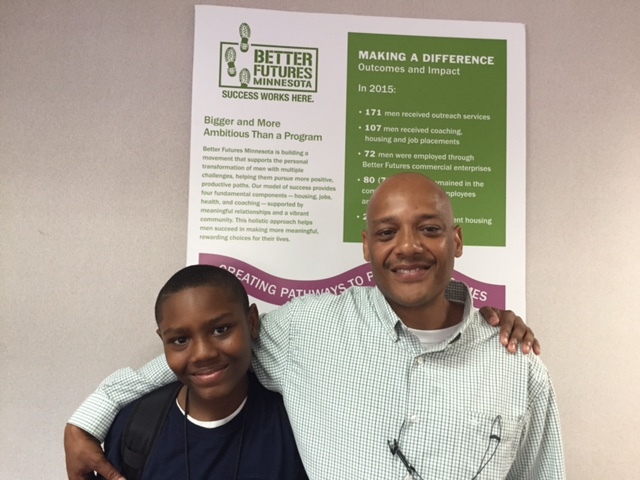 Ronald shares his story about how Better Futures Minnesota helped him walk a positive path in life. How did Better Futures help you transition in the first few weeks? I got right into all of it right away. They didn’t have to say anything. I just had to commit. I had to get integrated. I got a job the second week I was in the program, matter of fact. What was your day like, work-wise? I got a job cooking at a company that makes a lot of frozen foods. For me, it was just a stepping stone, because I am trained as a carpenter. But I eventually got there, too. I did deconstruction for Better Futures. I learned how to tear things down very carefully, saving 80 percent of the materials. That was good training. And I work in a cabinet shop now. I get to do cabinetry work that I like. What are some things other things that Better Futures taught you? I learned about patience. Humbleness. And I also had to learn that extra drive, because I don’t want to be a pawn piece. I also learned about manhood. I learned to stop chasing the old idea of manhood. I learned it was different than what I thought it was. What did you learn manhood was, for you? I learned it’s about responsibilities. About humbleness. About respecting yourself. Because out of respecting yourself, you will respect others, too. You have no choice in that. We all need each other. That was a huge thing for me to learn. How does the Better Futures model that focuses on compassion and life coaching continue to help you today? I have my own place now. My son and I just moved into a duplex. Every day I learn something about being a father. Just little negative behaviors that I can’t do. Something as small as leaving some papers on the floor. They start adding up. And I have to be a role model for my son. What advice would you give people who are just starting the Better Futures program? I would remind them that they are just starting to grow. It will be hard. But without friction or agitation, you won’t know you are advancing. If you’re not having difficulties, then you’re not growing. There are times when it feels like it’s not going to stop, but you have to keep going. That’s how you advance. Better Futures Minnesota engages men who have had a history of incarceration, homelessness, poverty, and untreated mental and physical health issues to help them achieve self-sufficiency and a better future for themselves and their communities. Become a part of rebuilding lives through housing, jobs, health, and coaching supports that give men the skills and relationships they need to succeed.